For the average investor the picture above can be a common occurrence in one's investment track record. In fact, in the investment world this is taught as a rule; the common investor will buy high and sell low. Why? Because they don't spend enough time researching their investment purchases. 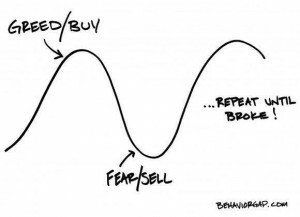 Instead they tend to follow the market news jumping in when it goes up, however, when the market falters, they are the first to panic and sell.